This spring, we published an examination of employment outcomes for Ontario PhD graduates from the class of 2009. Ontario’s PhD Graduates from 2009: Where are they now? found that more than 50% are working in higher education. Arguably more interesting are the employment outcomes of the 35% of 2009 PhD graduates who are working outside academia. Who are these folks? Where do they work? What did they study? The report revealed that graduates from certain disciplines are more likely to be employed outside the academy than others. 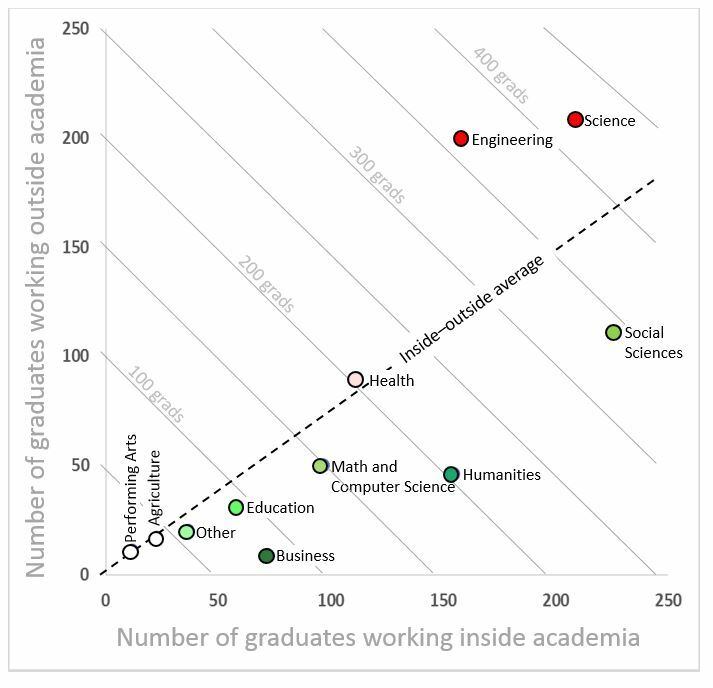 Those who earned their PhD in a STEM-related field – science and engineering grads in particular – are much more likely to be working outside academia than those who studied humanities, social sciences or business. Same goes to a lesser degree for PhDs in health, agriculture and the performing arts. This analysis contributes significantly to our collective understanding of the post-doctoral labour market. For the non-academically employed group, we matched employer information with the North American Industry Classification System for a closer examination of industry of employment. Among the most common employers of this group are government, crown agencies, big banks, hospitals and high-tech firms. A handful are self-employed. These grads are doing exactly what we might have hoped when we invested in their development… they are working in professional, scientific and technical services, manufacturing, health care and government. They are supporting the economy and contributing broadly to the wellbeing of the province and beyond. The 10,000 PhD Project at the University of Toronto is determining the current employment status of 10,886 individuals who graduated with a PhD between the years 2000 and 2015.